she'll proudly sleep all night in her own bed. "Cylinder" is not a verb. The news that William Safire has died leaves me a bit wistful. On the one hand, his politics were execrable. On the other, his explorations of language both written and oral were erudite and entertaining, not to mention a reason to open the New York Times magazine every Sunday. And, though it was words for Spiro Agnew, you have to respect one who can pen such an ace archetype of alliteration as "nattering nabobs of negativism". I do believe that he would have agreed that "cylinder" is not a verb. The number of strings on a harp. The code for international direct dial phone calls to Germany. William Faulkner was born on this day. So were Mark Rothko, Ethel Rosenberg and Glenn Gould. Emily Post died on the 25th of September. And it's the feast day of Saint Finbarr. But today? Today, today? It's my husband's birthday. Happy birthday, sweetie. The inimitable Niobe finds all manner of electronic ephemera, most recently the website of the Oracle of Delphi. One of my teeth has been bugging me, so I thought I'd address the problem to the Oracle. What's the matter with my tooth? Whose wrought chronologies be not to scale. My dentist, whose office is adorned with a cringe inducing foot-powered drill and and antique dental cabinet of many small drawers, will be amused to hear that his is a "storied industry". Later in the day, I was poking around my child's elementary school's website. The site has links to some other educational sites, including the National Library of Virtual Manipulatives. Putting aside the weird jargon of "manipulatives", I was struck by the notion that children in the K-2 age group might be expected to know what the Sieve of Eratosthenes is. Do you know? I'd never heard of it, but, as ever, Wikipedia elucidated me: it's an algorithm for finding prime numbers. So, dear readers, where have you found Greek today? I thought only Congress could decree things to be "National Day of Thus and Such", but Hasbro has proclaimed tonight to be "National Family Game Night". And even though I'm kind of viscerally opposed to participating, sheep-like, in invented holidays, I rather like sitting down en famille and playing games. Unfortunately, while we could play Jenga, or Chutes and Ladders, or Pictureka tonight, I think we're stuck playing an Everyday Math version of War instead. The joys of homework: it involves the entire family. Oh, I know, I've been down this road before, what with my evisceration of the Smencils and their packaging. But at some point while I was mulling over the whole recycled pencil situation, and poking around on the intertubes, I came across another purveyor of recycled pencils. One thing led to another, and a week or so later, I had a bunch of O'Bon pencils and a couple of their notebooks on my doorstep. Let's start with the obvious: they're not scented. You don't need to wash your hands when you're done writing with them, because they're not scented. You don't have to wrinkle up your nose and cringe, because they're not scented. This is a good thing. The mere idea of scented pencils is just bewildering - why did someone think that was a good idea? So, O'Bon = good, because they don't smell. But they are also fetchingly designed. The company sent me five packs of pencils. A dozen colored pencils, each one wrapped with a vibrant photograph of fruit in the appropriate color. Three 10 packs of black pencils: pop-art rainbows, animal prints, and my favorite, newsprint. And a set of artist pencils - 10 pencils graduated in hardness. Each set is packed in a cardboard box; the 10 packs are in an efficient triangular box - no plastic tubes! no vinyl case! They sharpened easily, and did I mention that they don't smell? Why buy O'BON products such as O'BON pencils? Multiple reasons. By using old newspaper to make our pencils, we aren't cutting down any trees or using any new raw materials to make our products. By choosing O'BON, our customers are making the better environmental choice. The graphite in the pencils are wrapped with used newspaper so tightly that the graphite inside is given a strong layer of protection. This means that the graphite hardly ever breaks, resulting in a pencil that lasts about 3 times longer than the average wood one. And to top it all off, our designs are the best in the business. 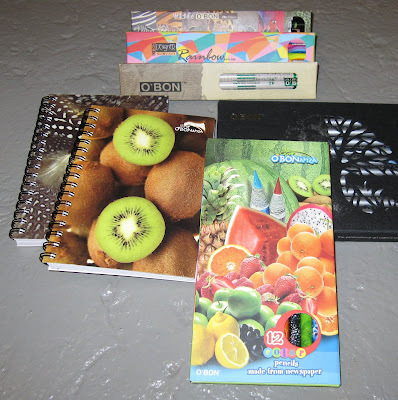 Disclosure: The company sent me 52 pencils and two notebooks, for which I paid nothing, but which have a retail value of under $30 in the aggregate. Nobody paid me for this review, and the giveaway was my idea. It's my mother's birthday. Or it would be. Actually, I guess it is. After all, January 27 is Mozart's birthday, and he's been dead for a lot longer than Moky has. What to say, what to say? I kind of want to mark the day in somehow, and she has been in the back of my head all day. In some strange detour on the web earlier, I found a plastic birdhouse that repels dogs - if the dog barks, the birdhouse makes a noise that shuts up the dog. It would have been a perfect gift, a yard ornament to combat the neighbor's barker that drove her bananas - especially because she'd never have spent $69 on a plastic birdhouse of dubious merit. I thought about the last time I saw her - I kissed her cheek before the undertaker zipped her up. And then they bumped the removal trolley down the front steps and hoisted her into the waiting Cadillac hearse. At that point, my sister turned to me and said "she'd have hated that". "Yeah", I added, "it's a good thing it's so early that none of the neighbors are up." She was easy to buy presents for - she was abstemious and frugal - so I could get her a stellar piece of cheese or some fancy chocolates or a soft and lovely sweater or the fleece hat she's wearing in the photo to the left or a brand-spanking-new hard cover book just out - and she would be pleased and tickled and happy to eat the cheese, washed down with some boxed wine. But a ride in a limo would have appalled her, just as she had no interest in manicures and massages - too indulgent, too ostentatious. She would have been 74 today, and I wonder what she might have liked, this time, this year. Happy birthday, Moky. Requiscat in Pace. And I hope Mozart is there singing the Ave Verum Corpus with you. On the other hand, the fact that my husband isn't going to work every day means that he's cooking dinner every night. Oh, he cooked a lot before, but now he's got more time to devote to it, so it's not just hamburgers and a salad alternating with pasta. And I've become the executive chef. What's been happening is I look at the list of vegetables from the CSA, the list we keep on the fridge because otherwise stuff gets skanky because we forget about it, and I say "how about you make ______?" We had beautiful baby Red River kale, plenty of onions, and one Delicata squash. So the other day, I suggested risotto with roasted squash, kale and caramelized onions. He makes a fine risotto, though he usually sticks to ham and peas, or ham and asparagus - but he was game for the vegetable variation I suggested. Both the squash and the onions take a while to do, so it's totally not the kind of thing you start after work. I can't give you a recipe, but he roasted the squash, pulled it out of its shell, and chopped it. He cooked four onions until they were nice and golden brown. 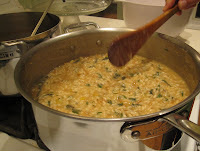 The squash and onions were added to the risotto about midway through. The kale got rough chopped and thrown into the risotto about five minutes before the end - just enough time to wilt it. There was plenty of parmesan involved. Easily crumbled or crushed into powder. It’s how I’m feeling these days. I don’t think I’m toxic, as in friable asbestos, but I’m certainly frayed around the edges, and in need of binding. Or a new hem. I don’t know why. Could be that it’s getting darker earlier. Could be that I keep getting calendar reminders that my mother’s birthday is – would be? – next week. Could be that the child is pushing all of my buttons. Could be that I’m just worried. Sunday, we headed off in the car for an adventure – lunch and a garden tour. We hadn’t even gotten to the bottom of our street when the kid burst into hysterics and wailed that she wanted to go home. Naturally, I kept driving. She continued to sob, her father started to glower, and I wanted to leave the two of them on the side of the highway to walk home. As we pulled into the iconic roadside attraction hamburger joint for lunch, she sniffed and asked for a Coke – and perked right up when I said yes. A Coke, some chicken nuggets and a ride on the 50¢ helicopter and she was right as rain. Like everyone else I know, I’m kind of worried about money. 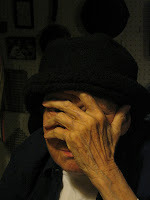 My husband has been out of work since April – not because he was laid off, but because he’s gone blind in one eye. When it first happened, he was told that there was a good chance that the vision that spontaneously disappeared would spontaneously return. It’s now been nearly six months, and there’s been no change. He received short term disability for a while, but that ran out, and the process of filing for long term disability is deeply convoluted and increasingly attenuated. So, we’re short a salary, and we’re paying more for health insurance, and there are property taxes and mortgages and bills bills bills to be paid, and the girlie needs new shoes. On top of the worry brought on by the eye problems and attendant absence of cash is the fact that I was hoping, dearly and not unreasonably hoping, that his job was going to morph into the kind of wonderful that would allow me to quit mine and find something part time and close to home. Alas, that wasn’t meant to be. And I shouldn’t whine – I do have a job after all, and we do have health insurance, and we do have a roof over our heads. But I’m tired, and on Sunday, after we got home from our salvaged outing, I was struck by a palpable feeling of not rightness, a physical manifestation of whatever dark cloud is sitting on my soul right now. If you look at me sideways, I’ll burst into tears. I turned off my alarm this morning, and forgot to get up. I'm waylaid by inertia and I'm cranky to a fare-thee-well. Do tell me that this too shall pass. It isn't the best photo, but I needed to memorialize the contents of a file drawer of my mother's. 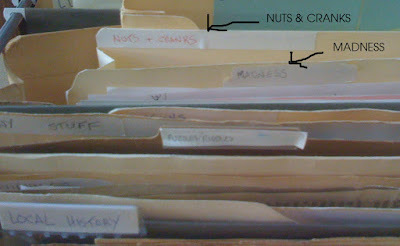 There's a file in there labeled "Nuts and Cranks" and another labeled "Madness". I don't even know what's in them, but it doesn't much matter, does it? Sometimes you can judge the book by its cover. Let's Review: Reduced Calorie Orange "Juice"
Really, the only reason I bought a container of Trop50 was because I had a free coupon and a hare-brained idea for a so-called performance art piece for my own amusement. But then, once home, I had to try it. Right? Waste not, want not? It cavorts in the grocery case with the real orange juice, all those 64 ounce cartons lined up, with a little pulp, a lot of pulp, no pulp at all, from concentrate, not from concentrate. But it's sneaky, it's a 59 ounce carton, a little taller than the others, a little bit more slender, and holding 8% less. Deceptive, if you ask me. So, they took regular orange juice, watered it down, and added stuff back in - like sweetener (the Reb A, also known as stevia) and thickener (modified food starch) and flavor. Okay, okay. The real question is - how does it taste? Frankly, it's not very good. I tried it side by side against a glass of regular Tropicana orange juice - in a blind tasting (yeah, I roped my husband into serving as my lab assistant). The Trop50 doesn't have the same mouthfeel of the orange juice, it tastes artificially sweetened, and it has a vaguely bitter, unpleasant aftertaste. You want fewer calories than the 110 in an eight ounce glass of orange juice? Drink less juice. Or water it down yourself. Or drink water with a lemon wedge squeezed into it. Or just have a glass of water, and save all the calories for a nice, refreshing gin & tonic on the back porch at the end of the day. Disclosure: I got a free coupon for this "juice" at the BlogHer conference, so I paid nothing for it. And no one paid me for this review. It's overcast again, just like it was last year. Actually, it's more than overcast; it's raining and drizzling, stopping and starting. And once again, I'm glad that it's not that shockingly brilliant bright blue sky punctuated by smoke and horror. This past April, President Obama signed legislation to recognize September 11 as a federally observed National Day of Service and Remembrance. How does one participate? Just set aside a little time this 9/11 to plan or perform at least one good deed that helps someone else who may need assistance, or to support a cause that you care about. You choose. As my contribution, I'd like to first point you towards the August Just Posts, as rounded up by Holly and Alejna. As ever, they've compiled some good posts to read, including, if I may pat myself on the back, my post about the cost of a colonoscopy. Second, if you missed it, there was a special issue of the New York Times Magazine last month, focused on women, and "how changing the lives of women and girls in the developing world can change everything". The centerpiece was an article by Nick Kristof and Sheryl WuDunn, excerpted from their new book Half the Sky. There’s a growing recognition among everyone from the World Bank to the U.S. military’s Joint Chiefs of Staff to aid organizations like CARE that focusing on women and girls is the most effective way to fight global poverty and extremism. That’s why foreign aid is increasingly directed to women. The world is awakening to a powerful truth: Women and girls aren’t the problem; they’re the solution. Kristof and Wu, helpfully, included a sidebar labeled Do-It-Yourself Foreign Aid, and so, in the spirit of this National Day of Service and Remembrance, I am going to send a donation to the Friends of Edna Maternity Hospital, in support of the Edna Hospital in Somaliland, and with the hope of helping to alleviate obstetric fistula. The square root of eighty-one. This Labor Day, this end of summer day, I cast about for something productive to do and lit upon the mountain of CSA peppers. 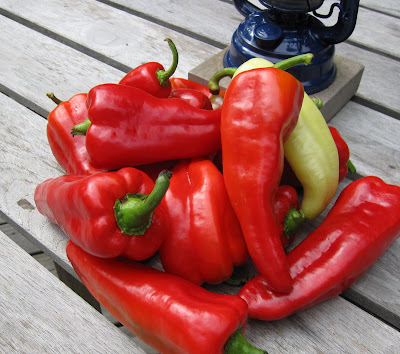 Somehow, what with being away for a while, and trying to eat all the vegetables that don't keep so well, we'd ended up with a dozen perfect red Carmen peppers, along with assorted other small peppers (like that yellow one - a banana pepper, maybe). In a fit of great madness, I decided to roast and marinate and can them - yes, actual mason jars in boiling water bath. 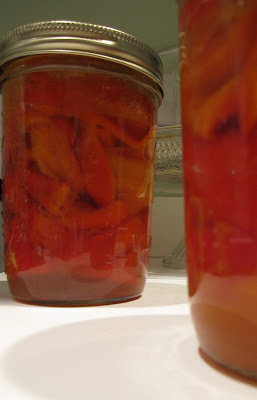 The jury's out on whether it was worth it, because it was rather a lot of work for three pints of pickled peppers. But lordy, do I feel butch. I used a book called Well-Preserved, by Eugenia Bone - she'd gotten a write up in the Times in the spring, and the book had wormed itself onto the list in my head. 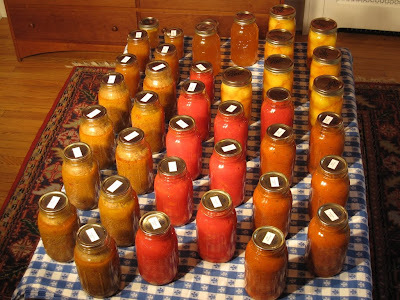 It's a small, idiosyncratic cookbook, a general demystification of the canning process with lots of tips. I might actually try making sauerkraut later in the fall. I don't think I'll can my own tuna, because, um, blech. Labor for labor day. Somehow, it seemed apt. Here are some of the pictures we took on our trip to Maine. Click on the picture; it'll take you to a web album. I hope you like them. We've just gotten back from a short vacation, up in Maine mostly. We left on Friday, a little worried about the possibility of Tropical Storm Danny getting in the way of our plans - but time and tide wait for no man, and we had a boat to catch. On the drive up from New York to Maine, we stopped for lunch at about the mid-point, at a pizza place in Worcester that I found on Roadfood.com. "Pizza place" doesn't really do it justice - this was the best pizza I've ever had: paper thin crust, perfect toppings. We got two - one with the usual tomato and cheese, which Mir ate almost all of by herself. The second one had sliced potatoes, caramelized onions, bacon, shallots, garlic butter and a sprinkling of grated cheese - no tomato, no mozzarella. I think I have never tasted ANYTHING as good. You'd have loved the place, if for nothing other than the mess of galvanized trays and stands and pitchers. We stayed in a little hotel (inn? what's the difference) up on Pemaquid Point - the kind of funky, gracious, idiosyncratic hotel that would have appealed to you. It had been built in the late 1800s as a boarding house - and still has the narrow hallways to show for it. I was tickled to find a huge antique nautical chart in our room - of Long Island Sound. Funny to find that up in Maine. After dropping our stuff, we headed out to a lobster place for beer and lobsters and bugs and the sunset. Mir said she wanted a lobster, and she duly ate both claws - even cracked them herself. Of course, she dipped the lobster meat in ketchup, but what are you going to do? Luckily, the threatened hurricane moved offshore, but did dump a lot of water - it rained all day Saturday, meaning that we had to stick to indoor activities. Luckily, there's a little aquarium on the next peninsula - so we drove over there and spent some time mucking around in their terrific touch tank. Mir picked up sea cucumbers and lobsters and starfish and crabs, and managed to get soaking wet - good thing we were inside, eh? After another lobster lunch, we headed to the mothership: LL Bean. What else to do on a rainy day? Mir got some new clothes for school and we headed back to the hotel, stopping in Wiscasset for a lobster roll at Red's Eats - thanks to a recommendation from Anna. It may indeed have been the best lobster roll ever - even better than the fancy one in Boston a couple of months ago that cost twice as much. After breakfast on Sunday, we headed to Rockland, to board our boat - the schooner Nathaniel Bowditch. Wow. Again, you'd have loved it. Granted, the accomodations are spartan, at best, and there are ladders to navigate to get down to the bunks and the heads and the galley, but the sailing was splendid, the food was great, the weather was perfect, and the boat had an abundance of character. We were encouraged to help with the sailing, like providing muscle to raise the mainsail and pull up the anchor, but mostly we just stared out at the glorious wild coast of Maine. And people stared at us! There are so few of those big old sailboats left that when one shows up, everyone looks and takes a picture. We sailed from Rockland up to Castine and back, anchoring near Warren Island one night, and in Pulpit Harbor the next. And on that second night, Mir slept up on deck in a lifeboat with the four year old son of the captain - counting 3000 stars in the sky! After docking again the next day, we moseyed down to Boston - with a stop in Yarmouth for lunch with an old friend of mine. She's got a house on the water with killer views - no beach, too cold to swim, but beautiful none-the-less. I know that you'd rather have a beach and warmer water, but you'd have liked this, I think. Boston was a great way station - we checked into our swanky hotel and headed straight to the pool/hot tub/sauna/steam room. After all, we hadn't had a shower on board the boat, and hauling up anchors is hard work! We had an early dinner at an old German beer hall, thanks to a recommendation from Erika - the blog friends really came through on the restaurant tips. Finally, yesterday, we drove home via the scenic and indirect route. One thing led to another and we stopped in Northampton, to show Mir where you'd gone to college. I had an ice cream cone there that knocked my socks off (well, I wasn't wearing socks, but, you know). It was Burnt Sugar 'n' Butter ice cream - sort of caramelly, with a salty kick from the butter. Looks like there's a Herrell's in Huntington - I wonder if you've ever been there? We put enough miles on the new car to break her in - and she performed beautifully. She's fun to drive, and perfect for our little family of three. And Mir tackled three whole lobsters, though all little one pounders - not like that enormous one you once had on Cape Cod. I think it might have been the perfect vacation, even if it was only five nights away from home. I'm sorry you weren't there. P.S. I'll have some photos to show you, soon.